Rates: See website for details or contact me. 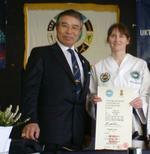 I am fully qualified ITF International Instructor, 5th Dan Black Belt and member of the ITF. The ITF is the biggest Taekwon-Do body in the world. My association is the UKTA which is the original Taekwon-Do association in Britain, founded by Grandmaster Rhee Ki Ha. I am proud to have trained and graded under the man who introduced Taekwon-Do to the UK in 1967. I have been doing Taekwon-do since 1986. We have classes in Wirral and Liverpool, and are the only Sport England Clubmark accredited Taekwon-do school on Merseyside. I'm also a chemistry graduate, BSc. (hons) PGCE. Qualified and experienced chemistry teacher and examiner for A level chemistry, and senior examiner for GCSE chemistry. Also a teacher of KS 4 Anatomy & Physiology and Biochemistry.